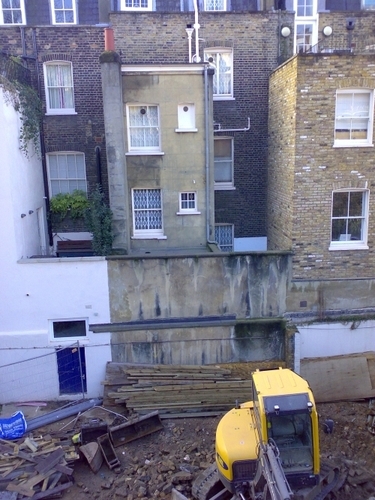 Excavation of a new basement level was required as part of a major refurbishment and extension of an existing apartment block in central London. To demonstrate the proposed method of excavation would have a negligible effect on the existing properties, RJM Ground Solutions carried out a detailed analysis of the various stages of basement construction using PLAXIS 2D. RJM Ground Solutions (RJM) is a small geotechnical consultancy specialising in high quality geotechnical advice and designs to a diverse range of clients across the UK including BAM Ritchies, Murphy, JBA Consulting and RG Parkins & Partners Limited. Excavation of a new basement level was required as part of a major refurbishment and extension of an existing apartment block in central London. The proposed excavation was within a very congested former car park area and would take place immediately adjacent to a row of 5 storey Georgian town houses, many of which were founded on shallow strip footings (see figure 1). 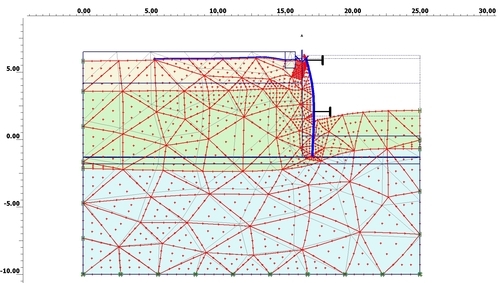 In order to demonstrate the proposed method of basement excavation would have a negligible effect on the existing properties, it was deemed necessary to undertake detailed FEA of the various stages of basement construction. RJM were contracted by the developer to undertake a detailed FE analysis of the contractor’s proposed method of basement excavation and provide a report which could be submitted to 3rd party property owners and their insurers. This work comprised a site inspection, desk study review of relevant data, numerical analysis and reporting. Prior to commencing numerical modelling RJM undertook a site inspection to view trial pits and discuss the construction process with the basement contractor to ensure this was fully understood. In addition, a detailed assessment of site specific desk study and ground investigation information was undertaken combined with a review of relevant technical papers on basement excavation analysis in central London. Based upon this work, a ground model and suitable soil parameters for the anticipated strain levels were selected for use in the numerical analysis. The analysis was undertaken using PLAXIS v9.0, modelling soil behaviour using the Mohr-Coulomb failure criterion with granular fill and terrace gravels considered as drained and the underlying London Clay as undrained (as only the short term displacements during construction were to be determined). 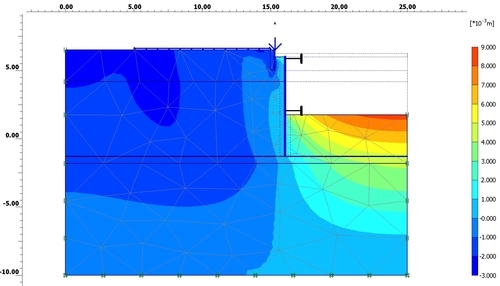 Analysis was undertaken as a series of drained construction stages and as such no consolidation analysis was required to calculate intermediate pore water pressures. The strip foundations of existing properties were modelled as fully flexible to prevent soil from “hanging up” and giving a false reduction in true settlement. Piles were modelled as plate elements and floor slabs as fixed end anchors. Loadings from 3rd party properties were applied as a combination of floor UDL and wall line load. 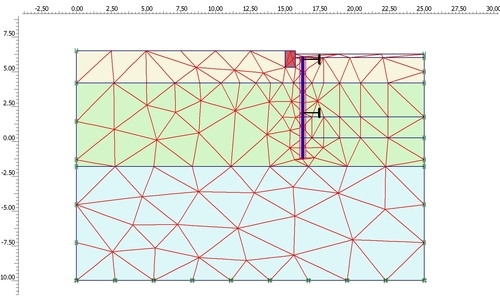 The problem geometry was meshed using 15 noded triangular elements with local mesh refinement to the piled wall as shown in Figure 2. The results of the analyses carried out indicated that in all cases ground settlements adjacent to the basement excavation were less than 5mm. This confirmation that anticipated settlements were to be very small provided reassurance to the adjacent homeowners and allowed a suitable structural monitoring scheme to be designed with appropriate action levels.